In Pre-Primary Ballet, we will start to introduce ballet terms, technique and basic ballet positions. This will reinforce the structured movement activities from previous class levels or introduce new dancers to the terminology. Because ballet, and dance are ever evolving, we will use influences from the Russian, Italian and German dance schools in our curriculum. Your little dancer will build a strong foundation for their dancing and musicality for their future. In addition, this class helps to develop coordination, self-esteem and creativity through imagery, activities and story plots. In Primary Ballet students will build the physical skills and maturity needed to learn ballet technique. Exercises facing the barre will be introduced to develop core strength, control, alignment and balance. Center work exercises promote flexibility, stability, and coordination. Students at the primary ballet are level are encouraged to enroll in multiple classes at a discounted rate to build upon their skills. Ballet-Jazz is designed for students who are interested in learning about both ballet and jazz. The class will introduce basic ballet and jazz movement, technique and terminology. In the Combo classes, dancers will have the opportunity to participate in both ballet & jazz. The beginner Dancer will focus on the correct ballet positions, technique, barre and center work, along with jazz fundamentals. More advanced, steps, combinations, leaps & turns will be taught in the more advanced level classes. Dancers have the option to choose to participate in any one or all of the dance form. This class will introduce a new style of dance for ages 7 and above. It will include upbeat, fast-paced movements in a version of street dancing. With age appropriate choreography and music, your dancer will be able to use their own unique style, in freestyle hip hop funky way. This class will include all the recent hip hop moves and styles of the ages. All class cards expire 6 months from purchase. Seasonal camps are normally one-week (5-day) programs offered during this regular yearly public, private and home-school breaks: Spring Break, Summer Break, Thanksgiving Break (3-day camp), and Winter Break. Camps typically are held from 8:00 am to 4:00 pm daily. Aftercare available until 6:00 pm. Full week camps are $159, but are available as low as $87 with multi-week discounts. Intermediate and advanced level dance intensives are normally two-week (10-day) programs offered throughout the Summer, and one-week dance intensives during school Spring Breaks and Winter Breaks… from 8:00 am to 4:00 pm daily. Aftercare available until 6:00 pm. Prices vary, see registration information for details. Dance 411 is amazing!!! … Classes are great and they have something for everyone whether you are a beginner or advanced, young or old. No one judges and everyone has a blast! The place to be for anything dance! 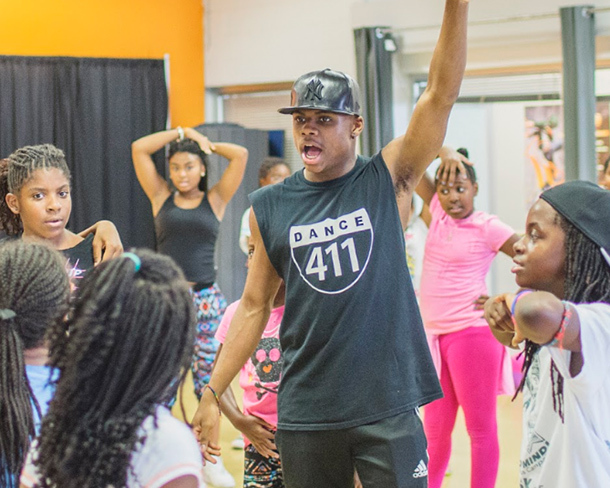 Dance 411 isn’t just about dancing, they help with confidence, and life lessons you can’t get at no other studio! So hope to see you soon so your son/daughter can experience all the greatness this studio has to offer!